Congratulations! You're made the most excellent decision to start raising koi fish of your own. Although it can be a little daunting at first to take on a new pet, you'll soon discover how easy it is to raise these hearty fish. Koi Story has put together this little guide to jump-start your knowledge on your fish pond/habitat, koi care and other general koi knowledge. Shade: At least 50% of your pond should be covered by vegetation or another type of shade. Your koi fish need a proper mix of sun and shade. Oxygen: It's important to have a source of oxygen in your pond. Getting a pump to circulate and aerate your fish pond water, infusing much-need oxygen into your koi carp pond. Raising koi is impossible without an oxygen-rich environment. You have an important decision to make when the cold winter months begin to set in: do you keep you koi in your pond or bring them inside? Your pond needs to be a minimum of 4.5 feet deep to avoid turning your fish into a Popsicle. That's the first and main rule. Keep in mind that a pond that hasn't been cleaned in a while is effectively shallower if there is a build-up of debris at the bottom of the koi pond. 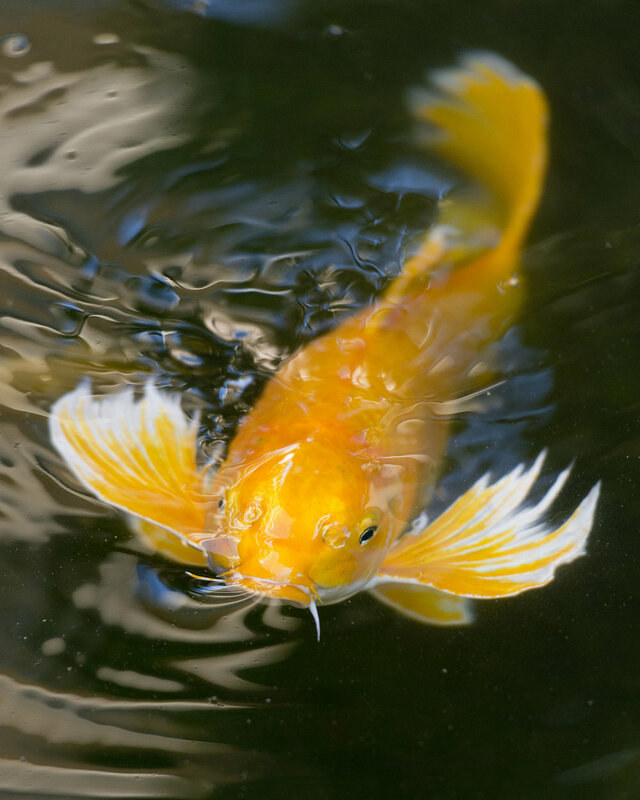 Your koi will not need to eat during the winter months because their metabolism slows to a crawl. They do continue to produce a nitrogen waste though so it is important to have a way to release this gas. We use a small trough heater which can be found at most farm supply stores. The heater keeps a small opening at the top of the pond throughout the entire winter. The hold lets the gas escape and keeps your fish safe from a dangerous build-up of nitrogen gas. It's important to keep an eye on the opening and clear it of snow if needed throughout the winter. If you can't keep your koi outside, you're going to need to bring them into a koi tank or koi acquarium in your house or heated garage. Be sure to give your fish plenty of room (rule of thumb: 1'' of fish for every 10 gallons of water), oxygen and food throughout the course of the winter. When the water reaches 50 degrees F outside, they'll be ready to go back into the pond. Make sure to gradually heat or cool differences in water temperature when transferring your koi fish to avoid shocking them. Koi fish have been raised to live to over 225 years old, making them the longest-living vertebrates on Earth. Raising Koi is relatively easy, fun and rewarding. Just be sure to follow the habitat tips listed here, feed your koi regularly and keep them safe from predators like herons, cats and hawks. Thanks for reading our guide on raising koi fish. Do you have a tip that we missed? Tell us your koi raising tip here.